Had a great weekend at Rutland Water last weekend. There was a good turn out and plenty of wind to enjoy. I have a camera mount on the back of my canoe and captured a fair amount of footage over the weekend. Here are some of the best bits. Thanks to those that organised it. Yep, great weekend - thanks to all the OCSG folk for giving us such a warm welcome, was great to meet you all. Great vid Chris, edge of your seat stuff out there on the second day, Joe and I opted for beginners option of staying in the bay that day to practice our tacking. Great fun nonetheless. Last edited by fredster; 16th-April-2012 at 10:41 AM. Nice video Chris. With all that sitting out on the gunwale it may be time to think about side benches. It was good to see a few new faces and meet people. Looks like great conditions, gutted not to have been there. It was good to meet you both this weekend. Love what you have both done with your canoes. It was probably best to stay within the relative shelter of the creek while you test out your modifications and understand what works and what needs more work/ improving. Great idea to use the rudder to support the flexible leeboard BTW. Hope to see you again soon. There's me thinking of taking out my front seat to save weight and your suggesting benches!! I've got a fairly padded backside, so was okay. I was racing Keith, but didn't stand a chance with much more sail than me. He didn't realise though and thought I was just stalking him!! Given you followed me exactly around a couple of buoys near the creek I had a fair idea of your intentions, Chris! You might be interested in the sail area comparisons I have done - I had the rig out last evening to dry it out and because it needed some attention, so took the opportunity to measure it, including with the various reefing options. Full sail came in at 49.7 sq.ft - as it is nominally a 50 sq.ft sail I was happy my measuring technique is reasonably sound. With one turn it is reefed to 41.6 sq.ft; 2 turns=35.5; 3 turns=27.6; 4 turns=21.6 ;5 turns=16; 6 turns=11.3 - any less sail is not worth doing and I think would over stress the sail as the boom would be too high; I don't ever remember using it with even 6 turns but thought I would measure it like that for interest. When we started sailing closely together I had 2 turns on, therefore 35.5 sq.ft - very similar to yours. During our little trip to the end of the north arm of the lake when I was getting a fair way ahead of you, to match our speeds better I first put another turn on (making it 27.6) - this produced a similar speed to yours. Then out of curiosity I put another turn on (making 21.6sq.ft), which slowed me to much less than you - your video shows me being overtaken, so I unrolled it again back to 27.6 and over took you. Interestingly once we turned for home and were beam/broad reaching I had to unroll the extra reef I had put in (taking it back to 35.5sq.ft) to keep up with you. So across and off the wind our boats/rigs were better matched using the same sail area, but on the wind during the early leg I used less sail to achieve similar performance. Probably the difference between a lugsail and a Bermudan rig, though it was gusty and the shorter mast of the lugsail does make things twitchy. I mean if you hang out to level the canoe and the wind drops off suddenly, you quickly find yourself going backwards into the drink, so keeping the power on 100% of the time is hard work. When cruising it's easier to free off some of the sail, don't point so hard into wind and sit in a little more. I also noticed that the longer more streamlined shape of your canoe disturbed the water a lot less than mine, so your drag factor was much less than my canoe also, which makes a big difference as you know. Made me realise that racing canoes of different shapes and sizes, with different rigs can be hard to take seriously, compared to sailing identical boats with identical performances. Had a great time though. I think your observations about rig and boat comparison are about right, Chris. I was chatting to Dave S this afternoon and learned that my sail is actually 5 sq.m so 53.8 sq.ft not 50. My measuring difference is likely due to not measuring/including the luff roach (the extra curve outside a simple triangle if you lay the sail flat), as I was measuring it while still on the mast so I could reef it properly - a few percent needs to be added to the figures above. It was interesting to me that early on Saturday, Keith and i sailed down to the end of the lake. He had a full 5m bermudan on and i had the same but with a reef of one turn of the sail. We both kept pace with each other. After rounding the tower i took the reef out and we sailed back up the lake, again keeping pace with each other. By Keith's reckoning we had a difference of sail area of around 20%, and yet boat speed hardly varied between us on each leg. The computer predicts the drag of my canoe at 4knots to be around 4lbs, but at 5knots the drag is around 8knots. This equates to doubling the sail area for a 25% increase in speed. It was interesting to me that early on Saturday, Keith and i sailed down to the end of the lake. He had a full 5m bermudan on and i had the same but with a reef of one turn of the sail. We both kept pace with each other. Suggesting one of four posibilities. 1. His canoe has more drag than yours. 3. He wasn't really trying/ sailing the canoe as well. 4. He ate all the pies! Overall Joe, your setup seems to have worked pretty well considering the conditions. Love the shape of your outriggers and the lightweight aluminium poles. I might be tempted to rethink the way they connect to the canoe myself as I mentioned at the meet. While a novel & clever idea, I suspect that in time/ stronger conditions the white painted plywood brackets will break/ come away leaving you in on the water with disconnected outriggers and conditions that could be difficult to recover from. I would try to find a way to pickup the seat bolts or replace the current seat bolts with a threaded bar that has a nut and washer underneath the gunwale. It would require a steel bracket or large P-Clip to go around the pole and secure it to the gunwale indicated by Nut 1. The threaded bolt would go down through a washer then through the gunwale, through another washer and be secured in place by Nut 2. Another five or six inches of threaded bolt would hang down below this and on the threaded bar would hang your seat hanger bracket followed by another washer and finally Nut 3. 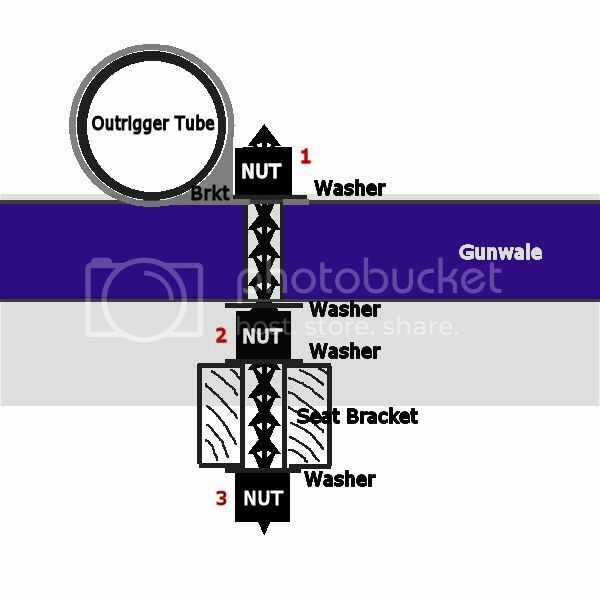 This system would prevent the tube from lifting clear of the gunwale thanks to Nuts 1 & 2, without putting an upward compression force through the seat hanger, yet the seat would take the load of a person through Nuts 1 & 3. Food for thought. The point that i was trying to make Chris was that reefed or unreefed we seemed to sail at around the same speed. This shouldn't make sense Dave. If you have more sail, then you have more power and if you have more power, you should travel faster! If your weren't then something else has to be slowing Keith down or speeding you up. When Keith and I sailed together, he reefed down to a similar sail area to me and we travelled around the same speed. When he put in another turn he slowed down and I started to leave him behind and when he took out a couple of turns, he caught me up again. This is what i would have expected. Why you were able to sail at the same speed as Keith with less sail area must be down to other factors like weight, drag, trim etc. Of course it could be that your were sailing better, using all of the available wind, keeping the boat flat & level, setting the sail to the most efficient position (Remember that conversation we had about tell tales), holding on to every available gust and not spilling the wind. Remember Einstein, E=MC2. Energy cannot be created or destroyed! I'm not sure that I was using full sail when Dave is talking about - I'll have to look at the photos and video taken (later when I get home) and try and remember. If you have more sail, then you have more power and if you have more power, you should travel faster! If your weren't then something else has to be slowing Keith down or speeding you up. Sounds like I missed a good weekend at Rutland. Attending appealed, but would have meant missing a couple of days of canoeing and camping with friends on the Ardèche: we'll have to sail with you all another time! Re. the speed thing - what Dave's repeatedly noted is how little difference the rig makes when going downwind in light winds. Of course, it make a slight difference, but as your pace downwind approaches wind-speed... the apparent wind (force on the sail) becomes ever less... and as the canoe wallows on what has to be the ugliest of all conceivable points of sail... I suspect most of us just switch off, drift along and wait for an opportunity to turn across / into the wind. Maybe that's one reason racing doesn't appeal to me: I've enjoyed surfing with a sail up, but by and large I'd rather ditch the sail and just enjoy the paddling when it's a downwind leg! Without every having raced seriously, I get the impression that when we turn upwind (where forward progress increases apparent wind) the impact of small differences in sail area (in light winds) becomes much greater... as does the impact of a few paddle strokes, or of fine tuning the rig. The again, maybe that's just perception: I perhaps just wake up a bit more and pay more attention to performance! Hi Greg, hope you had a good time in Europe. I tend to agree that when Running (The downwind leg) can be ugly and technically the most challenging if things start rocking side to side. The Reach (Believe it is a Beam Reach - 90 degrees to the wind) is the fastest point of sail, but in my opinion the least challenging as gusts are less likely to tip the canoe/ boat over and tend to push you faster, which is great. I'm sure Keith will correct me here if I'm mistaken as it might be the Broad Reach that is fastest. I believe Close Hauled is the slowest point of sail, though it feels like the fastest. Fastest depends on what type of boat and rig - for our canoes I reckon it's somewhere between a beam and broad reach. If you search "fastest point of sailing" you'll get all sorts of answers from broad to even a close reach for different boats, but definitely not a dead run. For me a beam reach is easy - to get speed, but am I getting the most I can in those conditions? A dead run in a good blow is anything but boring - controlling the roll and getting the absolute most out of the rig with techniques such as getting the centre of effort over the boat to reduce rudder drag and sailing by the lee to get laminar flow - all keep me busy and engaged. Beating is about boat speed vs. pointing as well as seeking clean wind in a fleet. And lots of other subtle and not-so-subtle factors! A dead run in a good blow is anything but boring - controlling the roll and getting the absolute most out of the rig with techniques such as getting the centre of effort over the boat to reduce rudder drag and sailing by the lee to get laminar flow - all keep me busy and engaged. Beating is about boat speed vs. pointing as well as seeking clean wind in a fleet. And lots of other subtle and not-so-subtle factors! Nice riposte, Keith: you're far more of a sailor than I'll ever be! It's time I got my dinghy training up to date so that all this stuff rings more bells. FWIW, I do get the centre of effort of the sail over the centre-line when on a dead run. In the Flashfire, anything else tends to get a little too exciting! I suspect I "sail by the lee", but I'm not used to that terminology. I'm sure there's stacks else I don't do though. Sailing by the lee is very difficult as you are sheeting in so that the wind hits the back (Leach) of the sail and moves to the mast (Luff) rather than the traditional way, Luff to Leach, as this can be very close to Gybe point!!! Certain capsize will prevail especially in gusty wind shifting conditions we were experiencing last weekend. Brave man. You also need to free off the kicker to get a fuller sail, which can be a good thing, because traditionally you tighten the kicker on a Run to flatten the sail. The danger of a flat sail when Running is that the rocking motion can cause the boom to hit the water and again your getting wet, but a great advantage of my Expedition rig is the boom lifts from the boom jaws so it is high anyway. I think from memory sailing by the lee also requires the boat to be heeled over to windward instead of flat to get the centre of effort over the centre line and this flies against traditional thinking of keeping the boat flat to reduce drag, but I could be mistaken about that. It's an interesting subject though and there are sailors that swear by it and others that prefer a flatter sail and the more traditional approach. I have never tried it because I have always had a Jib and would just Goose Wing and take my chances! Edit: Just remembered what Eddie (My Mentor) said about sailing by the Lee. "Everything is backward, you sheet in to de-power the sail and bear away to feather the boat in a gust" I dare not try the push/ pull tiller let alone sail by the lee. That's like patting your head and rubbing your belly at the same time! Last edited by Steamerpoint; 18th-April-2012 at 04:40 PM. I was trying to make the point that boat speed is not just a product of sail area. We used to race quite a lot in the OCSG and we all used 44sq ft. The difference in the time of the winner and the last person was often 1hr and 2hr. That is 100% difference in average boat speed. Given that most canoes sail downwind at roughly the same speed, that difference is more like 200% on the upwind legs. This is all to do with how efficiently you are sailing. The difference in force that a 44sq ft sail and a 35sq ft can generate is around 25%, but this will only result in a speed difference of around 10%. So if you see someone sailing faster than you don't assume it he must have a bigger sail than you. That's a good explanation, thanks. With regard to the push pull tiller, having watched your video I'm pretty sure you'd go quicker with a push pull tiller as you seem to be playing the tiller involuntarily a lot with your conventional set up (due to the slop around the dead ahead position I reckon). When running downwind, especially in lighter winds, heeling the canoe to bring the centre of effort of the sail over the centreline of the canoe is a good thing. It reduces the drag of the rudder, but also the hull drag of a canoe heeled to 25% is significantly less than when it is flat. This is due to reduced wetted surface area. At faster speeds it is better to keep it flat to help planing and to increase the waterline length. That's what I thought it meant, and it's something I've quite commonly done. I just didn't recognise the terminology! One interesting aspect of paddle sailing in this manner (with the sail cleated off) is what happens when you screw up and slew around to windward: if you survive the turn and are still upright as you come onto a reach, it's great, but the shock-loading as you start the turn can prove a little challenging! Moving my mast forward a bit seemed to make this whole point of sail rather more manageable on my Flashfire. Makes sense if you think of where the centre of effort goes when you allow the canoe to level out a little. Ps. Is there any reason why one shouldn't "sail by the lee" on the main when Goosewinged with a Genoa (assuming a bigger boat)? I agree Dave. Most of my racing was done against identical dinghies and you learn this the hard way when you first start racing and come last by a long chalk! Hi Chris, where have you been mate. Not spoken to you in over a week I think! You know what, I was watching one part of the video where the camera had been knocked and was point down slightly and I thought the same thing, however it's a bit of an illusion. I extended my tiller to around 6-foot long so it needs to move much further to make very small adjustments on the rudder. There is almost no effort required to move it also as the leverage is so great. It is actually quite nice to use. You can just think about moving it and it moves. The only problem is though is when you hit big waves or big gusts hit you and you physically get bounced about in the canoe, you end up moving the tiller involuntarily and then need to correct the canoe afterwards. I was watching the front of the canoe on the video and found that it was tracking straight despite fairly big movements of the tiller. From a racing perspective though, your meant to hold the tiller still if you can to reduce drag, but hey it's a canoe with a little lugsail at the end of the day. Happily let someone take it out for a spin sometime to see what they think. I think it works pretty well for a traditional tiller setup! As Chris T said above you will be very close to gybing and in bigger boats this is a bad thing, as sadly many people get injured or worse each year in yachts accidentally gybing. Setting a preventer - a line from the boom end to the bow is one partial solution but in big winds the forces are frightening. Some authorities show the dead run point of sailing as the "don't go zone" to mirror the "no-go zone upwind. I can't see any reason why it can't be done if the Genoa is pulled in tight. Perhaps Keith has tried it on his Canoe. Think he has a Spinaker though and may be tempted to get that out on the slight leeward side instead, goosewing the Genoa but sail traditionally rather than sail by the lee. Keith? Edit: Just seen Keith's answer after I posted this. Yes, you've got it about right there, Chris. I have used a spinnaker, sailing by the lee with the main on the (slightly) windward side in light winds downwind - otherwise it would be boring, wouldn't it Greg?! Nice video Andy. I'm shocked to see MrS sailing with outriggers, what's the world coming to? He has been known from time to time to favour outriggers but rest assured they'll always be homemade. Ah that's reassuring! I've never seen him sailing with outriggers before (not that I've known him for years or anything). Even in those strong winds at Coniston in October he only had his inflatable sponsons (maybe that's why he fell in ). Man: What are all those canoes with the funny little sails? Woman: Oh that's the Canoe Sailing Group - they come here every year and they seem to have a whale of a time, ... well they must do, they come every year. Man: They seem a bit 'home-made', some of them have got 'jerry-rigged' outriggers. Woman: Yes ........ I think they're a bit eccentric! Man: Yes ......... I suppose if they were cyclists, they'd be on recumbent bikes! Nearly all sailors are surprised by the versatility, speed and seaworthiness of sailing canoes. Being considered a bit eccentric tends to go with territory of this minority sport. I just wish I had the time and money to be thoroughly eccentric. Last edited by GavinM; 24th-April-2012 at 10:10 AM. OCSG members Wayne "Cream of Manchester" D and Stuart S have recumbent trikes so "Man in watersports centre" could be right. Sounds like you'll fit in well Joe! I bought myself a recumbent (secondhand--goodness me, I couldn't afford a new one!) not long after getting a sail for my canoe. Great fun! I bet he spends a lot of time servicing the bearings in his wheel hubs! No. An ebay purchase from somewhere in Somerset. (My wife's folks live in the West Country.) I hear good things about D-Tek though. I paid near the going rate for a ten-year old Pashley PDQ. It wasn't anywhere near as frightening as companies seem to charge for brand new recumbents, though still more than I'd have paid for a cheap regular bicycle. Anyway, sorry I couldn't join people at Rutland. Would have loved to get out and join in had I been in the country. It looks like the weather was good and a good time was had. Am still hoping to sail down on the Medway at some point later this year, or on the East coast. I've been paddling rivers round here, but there isn't much open water here in Cambridgeshire and for short jaunts on rivers paddling is often the more efficient mode of propulsion (especially when you include set up time).